Connecting the Dots...: How Low Will They Go? 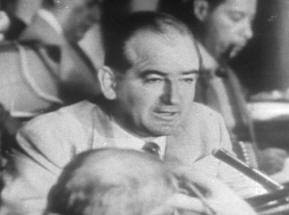 There is a famous turning point in the McCarthy hearings that took place in the 1950’s. Mr. Joseph Welch, the head attorney for the United States Army, had been repeatedly badgered by Sen. Joseph McCarthy during the Senate hearings. He finally took control and would not allow McCarthy to silence him. His famous words still ring true and clear, “You've done enough. Have you no sense of decency, sir, at long last? Have you left no sense of decency?" Some blogs and forums have fallen into the same cruel, reckless behavior that became labeled McCarthyism. Innocent people are being victimized by these web sites by the use of innuendo and conjecture. When they attack it is based upon no relevant facts, the police do not list their victims as POI or suspects, but these blogs/forums routinely go after thier targets full-throttle. This young man is a fine example of the harm such poor judgment can inflict. He is owed more than an appology. Read his heartfelt comment and then tell me you want to be associated with this type of persecution! "It is appalling that one of their own administrators is in direct violation of said usage policy. The site is working one angle only and it is to fan the sensationalism of their site. It is unfortunate that people are using this horrible situation to make money. The more traffic these sites generate, the more money the owners stand to make." Dont you do the same thing to joran van der sloot? Almost two and a half years later Joran Van Der Sloot is still a named suspect in the disappearance of Natalee Holloway. He was one of the last people seen with Natalee and he sat in jail for months, because his story about that night would change from day to day. Those are vastly different circumstances than what has been done to one of Nailah Franklin’s friends. When someone asked if the forum might owe the man an apology, one of the administrators says that they are not the only missing person’s forum on the internet that libels and defames innocent people. So, I guess that attitude makes it all okay.